Over the past 20 years, almost 30 new genes associated with autoinflammatory disorders have been identified. The genetic diagnosis is based on the identification of clearly pathogenic mutations, even in atypical cases (i.e. patients not meeting recognized clinical criteria). Therefore, genetic testing should be preferably ordered by healthcare providers who are familiar with the spectrum of clinical presentation of autoinflammatory diseases. The constellation of clinical findings will guide the choice of genetic testing. The prerequisites that are usually asked before requesting a genetic test for suspected autoinflammatory disease are: evidence for systemic inflammation, suspicion of a monogenic trait i.e. for example early-onset disease or familial inheritance, and existence of a plausible candidate causal gene. Sequencing approaches remain the gold-standard techniques. Sanger sequencing is a rapid, inexpensive method to test for mutations in a single gene in a single patient. 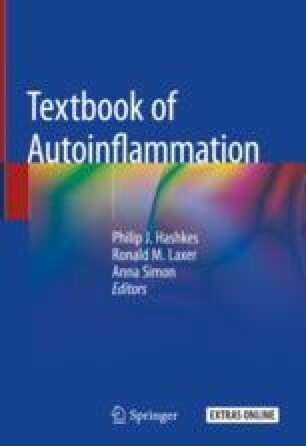 However, its performance is low (10–20%) when examined in all patients tested for autoinflammatory disorders, including those who did not fulfil the criteria discussed above. The indications for Sanger sequencing should be restricted to prevalent mutations and/or mutational hot spots in a gene (e.g. extracellular domain of TNFRSF1A responsible for tumor necrosis factor receptor-associated periodic syndrome—TRAPS), or to patients with a complementary biochemical diagnosis (e.g. mevalonate kinase deficiency—MKD, deficiency of adenosine deaminase 2—DADA2). If Sanger method is not confirmatory, large scale next generation sequencing (NGS) approaches should be contemplated. NGS allows investigations of multiple genes in multiple patients at a time. Targeted NGS sequencing of gene panels has become more time- and cost-effective and is commonly used today for phenotypically undifferentiated autoinflammatory diseases, genes known to harbour mosaic mutations (e.g. NLRP3) and oligogenism (e.g. proteasomopathies). New concepts regarding modes of inheritance and interpretation of variant pathogenicity will require a systematic review and update of genetic diagnostic strategies and new guidance on standardization and reporting of genetic tests.